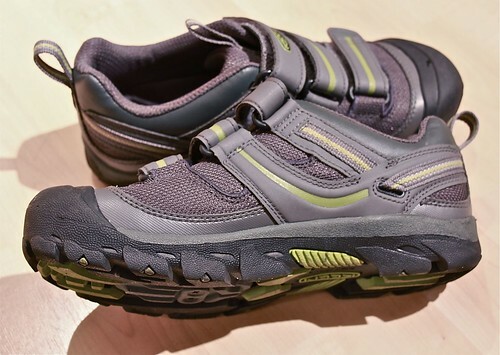 The new $110 Springwater II cycling shoe from KEEN is now available. This is a refinement of the original Springwater with one of the primary goals being lighter weight. Personally, I’ve never tried the original, but the Springwater II weighs just 28% more than Sidi Dominators in my size (456gr vs 353gr/shoe). 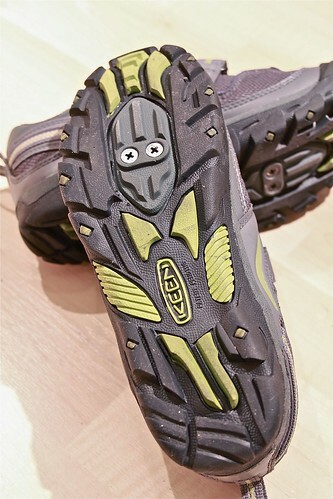 But while the Sidi is obviously a competition shoe, the KEEN is targeted at the commuter. Logically a commuter shoe should have good walkability, but I was surprised how comfortable they were. Keep in mind that my feet have surely been warped from two decades of hard cycling shoes and carbon speedskate boots, so my idea of comfort might be a little skewed. Yet the first day I got these I worked 10hrs on my feet, total comfort all day long. When the snow blanketed Seattle, these shoes had better grip than any of my current civilian shoes, and I walked to work in them (I’d had my fill of crashing in the snow the night before). I went to a concert on Saturday night, stood center of the crowd between the mosh pit and the stage, and had great traction against hard crashing waves of sweaty hipsters….and the toe guard worked great against people trying to muscle me out of my position. While the sole is of course stiffer than most civilian shoes, my feet actually prefer that, and the Springwater II gives pretty good arch support too. After 4 months wearing them, I seriously liked these Springwater II shoes so much, I might buy another just so I can have a pair for both types of pedals that I use. That’s all fine and good that the Springwater II is comfortable off the bike, but what happens when you clip in and ride? What happens is that the Springwater II delivers solid riding performance. They wouldn’t be my first choice for a 3hr road ride, but it wouldn’t be holding me back much. I used this shoe with Shimano SPD and Speedplay Frog pedals. The 2-bolt cleat pocket is deep enough so that fresh SPD cleats rarely grind audibly on concrete, but the rubber lugs don’t interfere with clipping in. 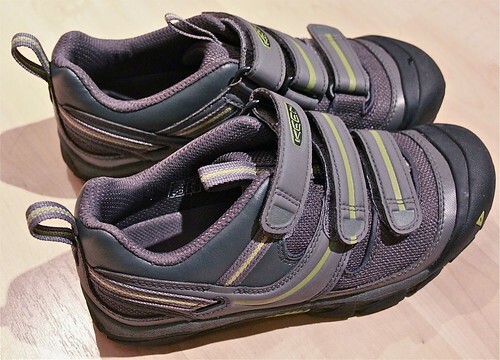 Though distinctly more flexible than a Sidi, the sole is still markedly stiffer while riding than the other KEEN shoe that I have reviewed, the Arroyo Pedal shoe. Essentially a clipless-capable sport sandal, the Arroyo is airy and playful for relaxed riding, but once you get halfway serious about pedaling the Arroyo lacks support. Not so the Springwater. Every time I sortie into the urban environment, I am launching yellow light sprints in these shoes. As a shoe targeted at commuters, the Springwater does quite well in drizzle, being neither chilly nor clammy, and drains reasonably well if soaked. If I know it’s dumping buckets, I’d still choose a Sidi Dominator though, since a competition shoe gains less weight when totally soaked. Also, since the Springwater has a substantial sole for walking, the broader sole prevents me from using the tighter booties that I use with my Sidi shoes. I also wouldn’t choose the KEEN for muddy offroad conditions, but if cyclocross was held in shopping malls rather than city parks, the Springwater would be my first choice. Holy crap, wouldn’t that be rad? run-ups on the downward escalator and a circuits in the food court! It would be A Sunday in Hell meets Mallrats.